(12th September, 2018; updated 13th & 21st September) – Communities in 22 countries across Europe – from Sweden to Serbia and from Ireland to the Ukraine – are celebrating the 2nd European Day of Sustainable Communities (EDSC) on 22nd September 2018. The EDSC is a celebration of the efforts and achievements of the thousands of local communities across Europe who are taking action for a more equitable, sustainable and decarbonised world. It is also about raising awareness among policy makers – from local to European level – of what is possible when citizens and communities are considered part of the solution to . 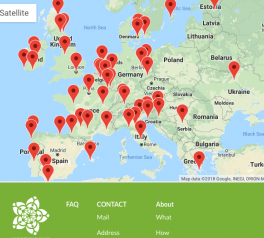 “We are delighted but not surprised at the level of interest and participation in the EDSC,” says Eamon O’Hara, executive director of the main organiser, ECOLISE, the European network for community-led initiatives on climate change and sustainability. EDSC events include festivals, open days, guided tours, university workshops, shared harvests, seed swaps, film screenings, community meals and conferences. Please see https://www.sustainable-communities.net/ for the latest map of events and further details. In Louvain-La-Neuve, Belgium there’s the ‘Maintenant!’ citizens’ festival organised by Transition Belgium with films, concerts, workshops, debates and conferences focussed on building the dream of a better world. Ecovillages in Ireland, Denmark, Spain, Slovenia, Sweden and Switzerland, many of which are members of the Global Ecovillage Network, will open their doors to showcase their pioneering efforts at sustainable living. In Kiev, Ukraine, ecovillagers and those involved in local environmental organisations will gather for the inaugural meeting of sustainable communities. Those involved in permaculture in Spain and the UK are holding their annual national gatherings. In Umbria, Italy, there’s an tour of a renewable energy park. In the Perigord, France an ecological centre is opening its doors to introduce visitors to surprising ways of living more sustainably. In London, UK community gardens across the city will welcome visitors and volunteers to take part in garden activities and share their harvest as a community. In Athens, Greece students are invited to explore how a sustainable community can begin in a sustainable school. In Dresden and Berlin, Germany, and Amsterdam, the Netherlands, teams of designers and developers who are part of the #GlobalGoalsJam will create actionable interventions towards achieving the UN’s Sustainable Development Goals. In the Universities of A Coruna in Spain and Lisbon in Portugal students, researchers and academics will reflect on and celebrate their work in transitioning towards sustainability and revisioning research. In Luxembourg there’s a day-long workshop exploring new ways of housing including information about already existing projects and available municipal support. On the island of Vir in Croatia, families will gather to make a first community garden on the island. In Edinburgh, Scotland there’s an evening to explore visions of the civic decision-making needed to achieve a resilient, regenerative, carbon neutral capital city. Two European organisations have this year become partners in the EDSC: Let’s Do It!, the Estonian-based organisers of World Clean-Up Day, a global movement of communities cleaning up rubbish and agitating for waste elimination; and La Fête des Possibles, the festival of community-led action across France and francophone Belgium, of which many events are also part of the EDSC. Within the context of the EDSC, ECOLISE is once again co-hosting a conference in Brussels with the European Economic and Social Committee, which represents organised civil society in Europe. This year’s conference – ‘Civil Society and municipalities: building sustainability through collaboration’ – is also being organised in collaboration with the Committee of the Regions, the EU’s assembly of local and regional authorities, and Transition Network. The conference will explore ways to encourage and support the type of collaboration in which communities that are working for change are inspiring and influencing local municipalities in how they work on climate change and sustainability. Over 200 people have registered to attend and registration is open until noon CEST on Friday 14th September. In keeping with ECOLISE’s culture of online meetings, which allow people to connect in a low-carbon way (with no travel footprint), the conference will be livestreamed here and online followers will be able to engage in the plenary discussions via online technology sli.do. For further information about online participation please see here. For further information and to register an event for the EDSC see here.